Help! I’m Ready to Send My Kid to Bootcamp! 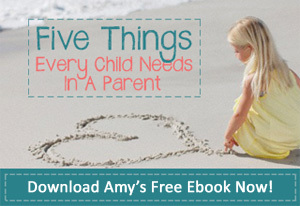 WHAT IS PARENTING WITH AMYSM ? At some point along your parenting journey, you will probably get to deal with defiance. If you don’t, I’d be surprised because it is normal and part of growing up. Back talk, disobedience and arguing are ways defiance often comes out. Little defiant people have temper tantrums while teens can get aggressive. When we think about defiance, we usually think about a more overt child that is loud, negative and determined. But, defiance is evident in a more compliant and cooperative child as well and can appear as a quiet passive aggressive defiance. Developmentally speaking, the times we see defiance most often is when they are either a toddler or teen. Regardless of their age, if the behavior persists for a long time, seems like it’s inappropriate for their age and disrupts the family, it might be time to consult with a professional. Their misbehavior is an opportunity to check in with yourself and see if the parent-child relationship is off track. If there is a disconnect, think about what you can do to reconnect. A 30-minute playtime with your child, lunch with your teen or perhaps a board game? Keep in mind that when our kids don’t feel a connection to us, they feel bad and when they feel bad they act badly. Warning! It is very easy to get disconnected from a defiant child. It can be helpful if you are able to determine the reason they are so angry. Could they be mad because you’ve asked them to do something and they don’t like being told what to do? Are they tired? Have they been following commands from teachers all day and they’re sick of adults telling them what to do? Are they getting sick? This doesn’t mean you’re going to excuse the behavior it just helps to know what’s driving their reactions. These defiant kids are more of a challenge to raise yet they are the leaders of tomorrow. If we parent them appropriately and effectively through the years they are in our homes, they usually soar. They have a strong core, they know what they believe, they are not afraid to take a stand and they are movers and shakers.